Even though the tagline for The Dark, a confused, disjointed mishap of a movie if ever there was one, claims it is "A Chilling Tale of Alien Terror," don't believe it. No, it's not 'chilling,' and as far as 'alien' goes...well...that's very debatable. To understand the finished product that is The Dark, one must look into all of the production woes that went into its creation. The original director was Tobe Hooper, but just a few days into the shoot, he was unceremoniously fired and schlockmeister John 'Bud' Cardos, whose only notable film credit was the 1977 William Shatner TV-movie, Kingdom of the Spiders, was brought in to finish. It's hard to know who came out ahead. The next problem facing the movie was the script. The Dark was orginally a serial-killer themed thriller about a murderer known as 'The Mangler' who likes to stalk and decapitate his victims. With Hooper on board, the killer morphed into some sort of 'living zombie' creature. After Cardos finished filming, the producers, eager to cash in on the huge success of that year's Alien, decided to change the killer into an alien from outer-space. 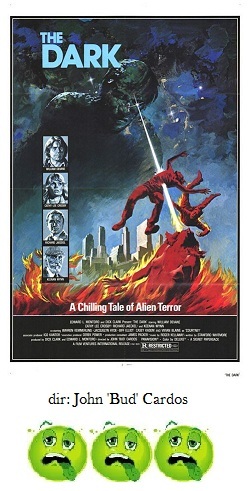 So, after a protracted period of post-production tampering, where such 'mind-blowing' effects as superimposed, such as fake-looking, laser beams shooting out of the killer's eyes that culminate into badly edited 'explosions' (which now qualified him to be 'alien'), The Dark was finally released in theaters and was an immediate flop. So, is it any good? Well, it starts out okay. There is some interesting atmosphere, a good sound-design and a creepy score, and the first attack scene does elicit some suspense and chills; unfortunately, it's all downhill from there. The bewildered cast includes William Devane, father of one of the victims who shows about as little emotion over the death of a child as ever has been presented on film, Cathy Lee Crosby as an investigative reporter and Richard Jaeckel as the detective on the case. These three just march through the film's many, many..........many dead spots as we the audience hope and pray the Mangler will take them all out. Sluggish doesn't even begin to cover it. Anyway, all of this is just a bunch of wasted time until the killer's big reveal in the finale. So, who's "The Mangler"? Based on what is on screen it would be safe to say that this alien menace looks more like a hobo. Really. It's just some guy with a clotted makeup job, unwashed hair and tattered clothing who growls and shoots the aforementioned phony lasers out of his eyes. It's hard to know what might have become of The Dark had Tobe Hooper not been axed. I suspect it probably wouldn't have been much better after all the recutting and tampering. Maybe it's a good thing he didn't stick around to tarnish his reputation. But then again, this is much, much better than the bulk of Hooper's other works (Lifeforce, Invaders From Mars and, coincidentally, The Mangler). Win some, lose some more.